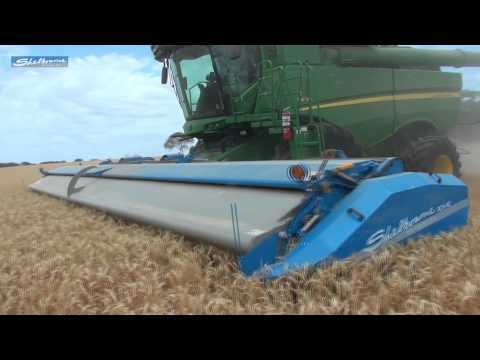 Larger capacity combines and larger scale farming in North America, Australia and Eastern Europe has prompted the next generation of stripper header development. The new machines are called the XCV Range. Machines are now running in both Australia and America. The XCV range comprises of 3 machines, the XCV42, XCV36 and XCV32. All machines incorporate a 3 section stripping rotor and two section auger. New features include a spring loaded pivoting adaptor plate system which when coupled to the spring loaded gauge wheels enables the wider headers to follow ground contours. The new machines are center mounted making them ideal for Controlled Traffic Farming applications.